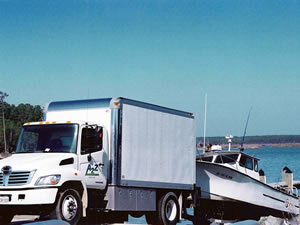 Customers such as Verizon, Maryland Department of the Environment, Vane Brothers, O‟Brien Oil Services, Pugs Fuel, Severstal, Dann Marine Service, Potomac Environmental, Maritime Alliance and Verizon benefit from A2Z Environmental Group‟s rapid and focused response to environmental emergencies. 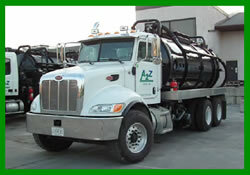 Our 24-hour emergency response teams handle sudden roadway spills, storage tank leaks and more. We solve unexpected environmental problems quickly, cost- effectively, and within regulatory compliance. In order to cover your needs A2Z has a 24 hr. answering service and at least six on-call managers to serve as off- hour emergency contacts. The managers receive and implement emergency delivery orders. The contact person also ensures that qualified personnel, well-maintained equipment, and administrative support are available to deliver the services you need, when you need them. We have established a strategic communication plan, organizational charts, and contingency plans for any type of environmental emergency. To prevent accidental exposure to the hazardous substance(s) being re-mediated, we isolate the affected area in accordance with all applicable federal, state and local regulations. When necessary, we employ a security force to ensure only authorized personnel are allowed access to the work area. These precautions prevent further spreading of the contamination and limit the liability that can result from it. Calvert Cliffs Nuclear Plant, British Embassy, Marine Spill Response Corporation, Covan, Johnson Controls, Norton Lilly and Constellation Power are only a sample of the many companies that have benefited from our rapid response and professional handling of emergency spill clean-ups both on land and water. Our experience includes contaminant source control and containment; in-situ and ex-situ soil treatment; excavation and removal; thermal treatment; groundwater remediation; decontamination and demolition; hazardous spills; and hazardous material transportation and disposal. 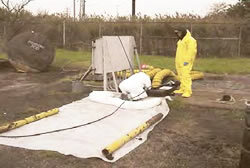 Mercury spill decontamination and air monitoring tests. We offer the full range of waste services to safely dispose of a wide variety of hazardous materials, including used solvents, PCBs, and laboratory chemicals (lab packs). We can provide cost effective transport for any quantity.